I don’t often go into Washington, D.C. as a tourist anymore. Having grown up just 40 minutes away in Virginia, I have seen nearly everything – the Washington Monument, the Capitol, the White House, most of the war memorials, countless walks up and down the National Mall, etc – on multiple occasions. But I am a museum and art gallery junkie, and there are few cities better for finding a fix than Washington. There are 18 major museums and galleries, plus the National Zoological Park, that fall under the Smithsonian Institution They are open year-round and offer free admission to the public. Many smaller museums and galleries are scattered throughout the city as well, and although the smaller ones cannot compete with the sheer magnitude of what one sees at the larger facilities, they offer a more intimate experience. On January 4, I experienced both of these worlds; from the vast sprawl of the Smithsonian National Museum of Natural History, to the quieter, more hands-on emphasis of the Koshland Science Museum. With their own set of pros and cons, it was fascinating to see how each one works to promote and teach scientific concepts. Upon entering the domed rotunda of the National Museum of Natural History, an impressive eight-ton elephant replica greets you. 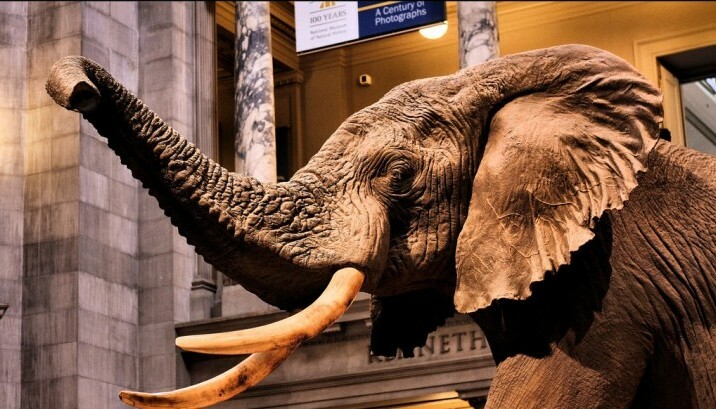 The journey down the Kenneth E. Behring Family Hall of Mammals proves it’s no fluke marvel. Replicas of other African game – lions, zebras, golden jackals, giraffes, hippopotamuses, and more – dot the vast first room. They are intensely life-like, as if walking through an indoor zoo that’s frozen in time. Moving along the exhibit takes you through the Australian wildlife – particularly its evolutionary history with the pouch-carrying marsupials – and then into South America’s tropical rainforests. Of special wonder is a small section dedicated to the nocturnal wildlife and their unique behaviors, like using echolocation to navigate and hunt for food. Further out takes you through everything North American. My favorite part was the progression of bears, from black bears of the southern part of the continent, to grizzlies of the northwest, and finally to polar bears of the Arctic Circle. The Mammals Hall leads directly into the David H. Koch Hall of Human Origins. All feelings about David Koch aside, the exhibit is utterly fascinating, revealing skulls and skeleton fragments as well as early tools and other relics, giving a glimpse of early human life. A small jaunt over to the Fossils exhibit only serves to underscore how far evolution has gone to bring us, the Homo sapien, to the present day. I ventured into the sprawling Sant Ocean Hall and quickly found a few exhibits that piqued my interest. The Portraits of Planet Ocean exhibit shows off Brian Skerry’s underwater photography expertise, depicting ethereal images of natural ocean wildlife, sometimes in conflict with the effects of human activity. This clash is a stark reminder of the delicacy of natural habitats and the ease with which humans erode this beauty. At this point I had only seen less than half of the first floor, but was dismayed to find a cacophonous bustle of other visitors swarming the museum, trying to squeeze it into their afternoon. With a ticket price of free, I can’t blame them very much. But each passing minute meant less and less time to enjoy everything the Ocean Hall had to offer. Unfortunately, the dinosaur exhibit was in a far more crowded state. It is closing for renovations in spring 2014 and this would be my last chance to see it for several years, but I felt it was too crowded to truly enjoy. I’ve always hated being rushed through museums, even if I couldn’t see everything. I left the National Museum of Natural History, and walked a few blocks over to the Koshland Science Museum, a comparatively new institution sponsored by the National Academies of Science that opened in 2004. I had read a few materials about its emphasis on hands-on learning, and wanted to see it for myself. The ambiance was immediately different from any Smithsonian building. It was quieter and felt cozy. The hall is not very big, but is dotted throughout by touchscreen computers meant to facilitate the learning experience. A group of college-aged individuals hunkered down on a table in the small first room, building what looked like models of biological structures. The whole place felt less like a museum, and more like a cutting-edge classroom. The first computers I went on offered a slew of animation-type lectures on various scientific concepts, like light pollution, dark matter, planetary movement in space and others. It was interesting stuff, although as someone with a pretty good knowledge of those subjects already, there wasn’t much fresh information to learn. Nevertheless, I was soon on my way to better exhibits. One on disease and nutrition was especially helpful in dispelling myths about dieting fads likes gluten-free, or explaining the rationale behind vitamin supplements and how exactly they work. The science journalist in me appreciated the citations to academic studies that accompanied the information. The driving simulator tasked participants with navigating a motor vehicle through a busy street while attempting to deal with distractions, like cell phone alerts. It was the closest a museum might ever get to becoming an arcade. I failed the simulator miserably – as is the point, of course! – but it certainly showed how distractions affect the brain’s ability to concentrate on specific tasks. Koshland’s best exhibit, however, is its Earth Lab. Visitors get a crash course in how human activity is hastening climate change. More important, however, are the simulators that visitors can play around with. Participants are able to act as world leaders and make changes to different global factors, like carbon emissions and alternative energy development, and observe the effect of their choices on temperature trends across the next 100 years. It’s fraught with trial-and-error, but works to educate on the nuances of climate change better than anything I’ve seen before. As I left, I began to realize that the common thread throughout Koshland’s various exhibits was learning to apply scientific progress and research to improving lives. The older we get, the more imperative it is that we learn how to use scientific research responsibly and effectively. It doesn’t seem to be enough to simply learn what is causing climate change or what the effects are – one has to play make-believe as a world leader in order to fully understand how the problem can be solved. Koshland can only make this happen with a limited amount of space and resources, but it treats the science with respect and reverence. On the flip side, big places like the National Museum of Natural History do a wonderful job at letting us feel like children, encouraging us to explore everything and reminding us that there is always more to learn. Sometimes it’s overwhelming, and often too crowded, but science sometimes feels that way. It’s a privilege to be so close to some of the world’s finest state-of-the-art exhibits, and it’s always a source of regret to never have enough time to see everything. Luckily, that regret is just more motivation to keep going back and see as much as I can. Editor’s note: This post is part of a mini-series in which Scienceline reporters write on location from around the globe during winter break. See related posts for a story on mangroves in Florida, and check back this week for a report on climate change preparations in the national parks of Alaska.